In 2008, Dr. Dimov was appointed a Member of the New England Journal of Medicine (NEJM) Advisory Board for Students and Residents, and served in this position for two years. Founded in 1812, the NEJM is considered the most authoritative medical journal in the world and it carries the highest impact factor (51) among biomedical journals. 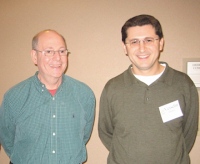 Photo on the right: Dr. Jeffrey Drazen, Editor-in-Chief of the NEJM and Dr. Ves Dimov during the NEJM Horizons Conference which focused on pushing the boundaries of traditional medical publishing, Babson Executive Conference Center, Boston, Massachusetts, October 24-26, 2008. Dr. Dimov summarized his impressions from the conference and recommendations in the three-part series NEJM Horizons Conference to Push Boundaries of Traditional Medical Publishing - Day 1, Day 2, and Day 3.